"I attack with tinkling, twinkling Gold Rutile!" Anime Biography: The self-professed strongest fighter in Card Capital. He starts the series off by stealing Aichi's Blaster Blade and betting it in a fight with Kai, attempting to use the rare card to beat him. While Morikawa is initially just a bully, he gradually shifts his attitude to becoming Aichi's friend. Katsumi accompanies Team Q4 to the regional and national competitions, but rather than participating sits on the sidelines and acts as a cheerleader. Late in the series he participates in the second and third shop tournaments. His character seems to have been retired as of season 2, being left behind at Card Capital while Q4 travels to the Asia Circuit. Manga Biography: Having a similar personality in the manga, Katsumi fills the same role in stealing Blaster Blade. Here he is a member of Hitsue Junior High's CF Vanguard Research Club, sponsored by Mr. Mark, but his overall role is reduced, as after the chapter in which the club is introduced Morikawa is not seen again. Universal Notes: His given name comes from 勝つ "katsu," meaning victory. It's intended to be ironic. Fan Culture: Morikawa tends to attract the most dislike as a character, being seen as obnoxious and as a joke that has overstayed its welcome by the western fanbase. He has a small following on pixiv derived from how lethal he turned out to be with a constructed deck, but outside of this he lacks the redeeming qualities that have endeared the rest of the cast to fans. While his favorite card is Juggernaut Maximum, Morikawa's deck has no set clan. His overall strategy is to fill it with powerful grade 3 units. Naturally, this causes him massive problems in successfully riding from one grade to the next, boosting his cards' power, and activating triggers. 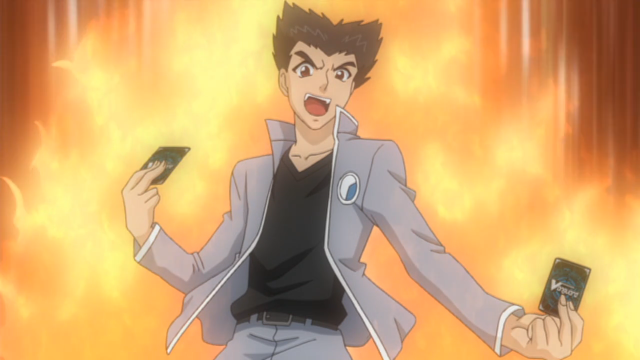 Morikawa overall is the worst cardfighter in the entire series run, being effectively the same after over 60 episodes of presence in the series and more than 20 consecutive losses. It's demonstrated in rides 51 and 52 that Morikawa is a good strategist, but only when given a deck that is itself already good; Morikawa's obsession with grade 3s proves his greatest weakness to be deckbuilding. For the duration of those rides, he borrows a Nova Grappler trial deck, at which time he becomes undefeatable until he actually buys the deck and decides to "tune it up," integrating the cards into his old grade 3 base. Unlike in the anime, Morikawa's manga self does not run a grade 3-centered deck, but instead a Spike Brothers-Tachikaze mix. 1. "Cardfight!! Vanguard (TV)." Anime News Network. ANN, 8 June 2012. Web. 8 June 2012. <http://www.animenewsnetwork.com/encyclopedia/anime.php?id=11763>. 2. Beveridge, Chris. "‘Cardfight! Vanguard’ Anime Gets English Language Dub, YouTube Distribution ." The Fandom Post. The Fandom Post, 4 June 2012. Web. 8 June 2012. <http://www.fandompost.com/2012/06/04/cardfight-vanguard-anime-gets-english-language-dub-youtube-distribution/>.